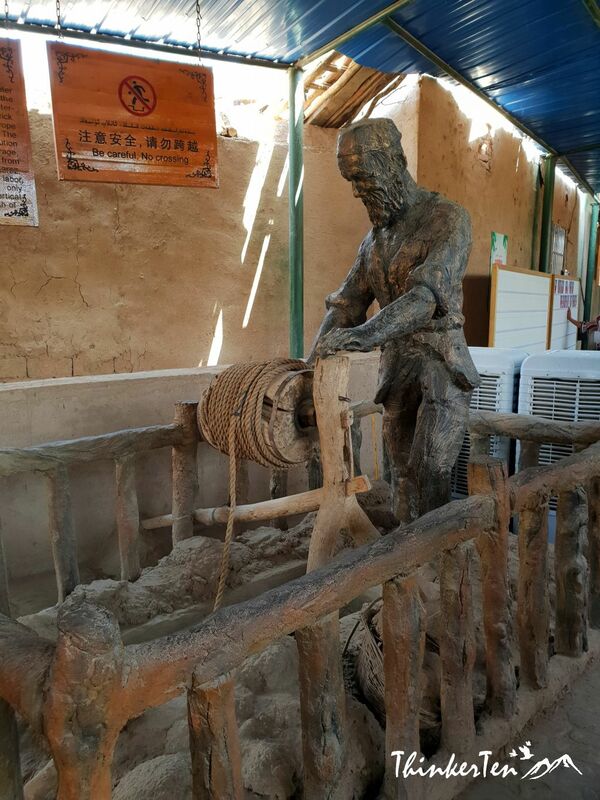 Karez Well in Turpan is one of the famous construction projects in ancient China. 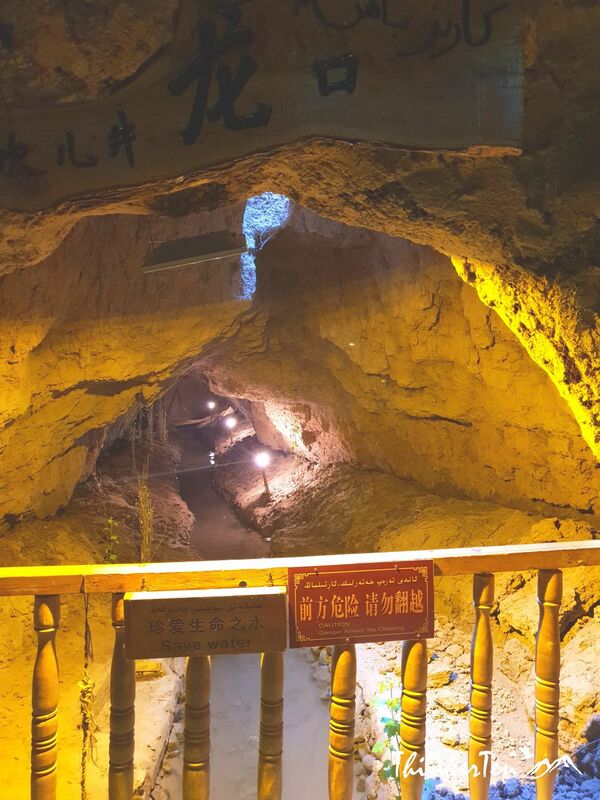 The reason of building Karez Well in Turpan was because of the local natural geographical conditions. The word Karez means “well” in the local Uyghur language. 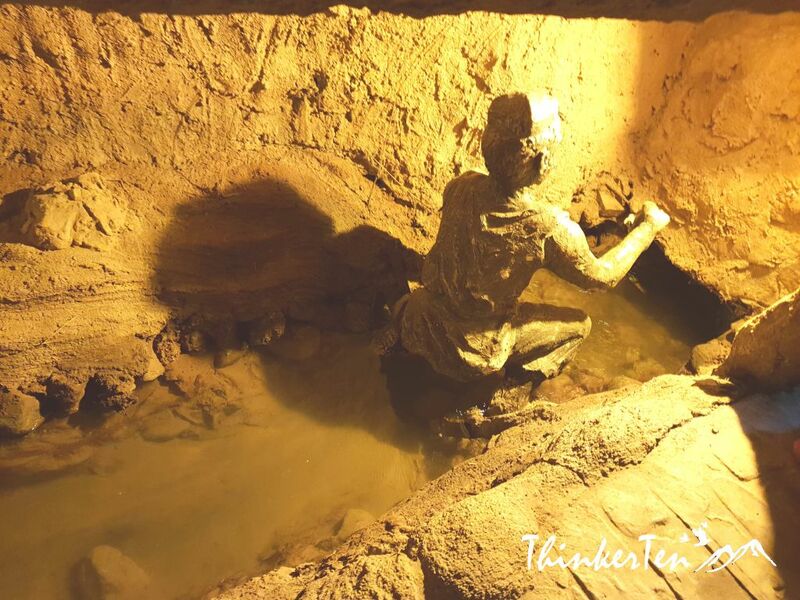 Why Built Karez Well in Turpan? The temperature in Turpan can go as high as 80’C, annual rainfall is less than 16 mm. So the ancient people in Turpan built Karez to find water resources. When you enter the underground, you see the water is gushing out and the temperature is quite cool – like in air conditional room. The Karez was man-made well, consisting of the vertical well, hidden channel, open channel and flood dam. Currently there are more than 1,000 Karez in Turpan with a total length of 5,000 km, accounting to 30% of the total water supply in Turpan. Ancient people risk their lives to dig and design a water system without using any sophisticated tool – they use bare feet and simple tools to dig underground tunnel. 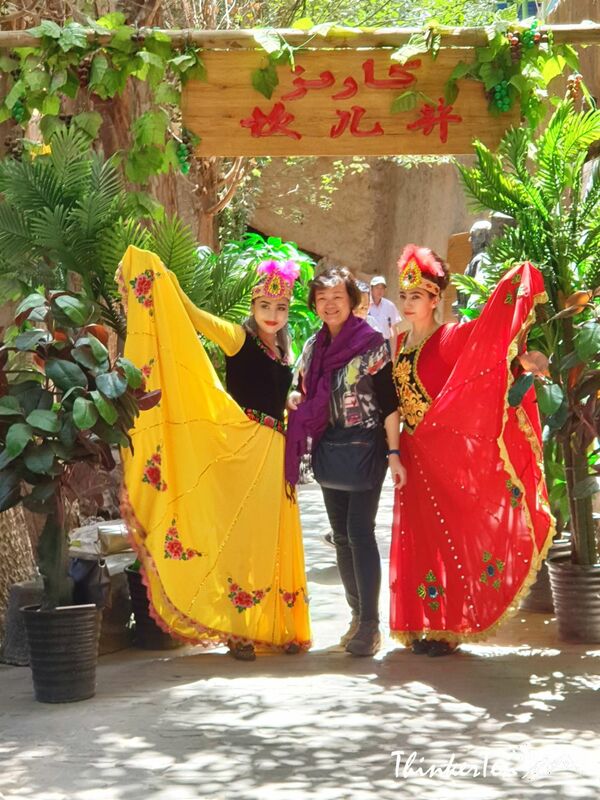 Turpan Karez, the Great Wall and the Grand Canal were 3 great works of ancient China. Spreading all over the Turpan Basin, the crisscrossing Karez look like an underground Great Wall, transport snow water from Tianshan into the Turpan oasis, nourishing orchards, farm and people living in this area. 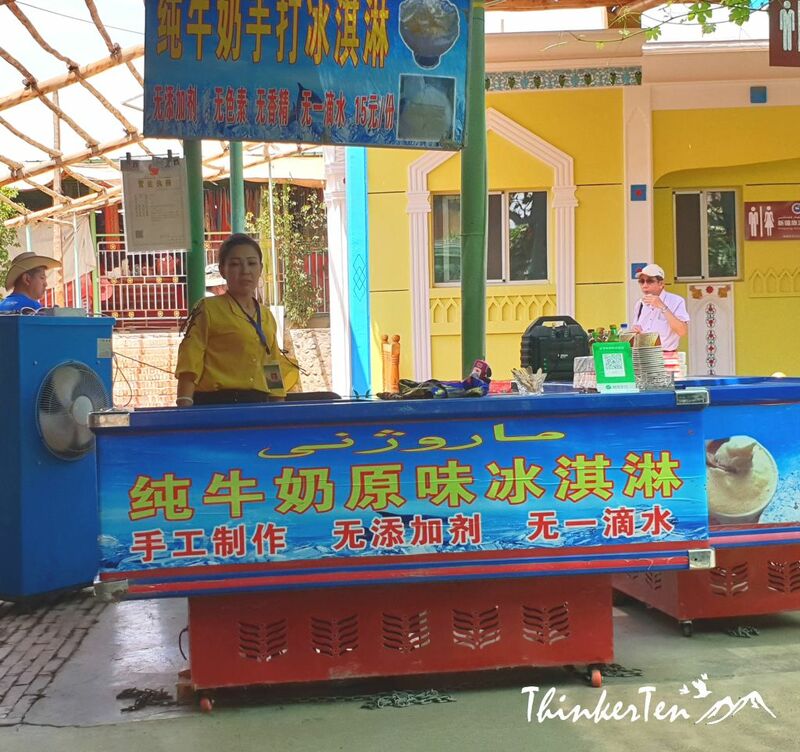 You may like to try the Uyghur yogurt ice-cream while in Xinjiang, cost about RMB 5.00 ( less than USD 1). It is really ingenious for the ancient people to invent the irrigation system back 2000 years ago and turning parts of this hot desert in Turpan into lush greenery. Karez system bring life to Turpan. The museum is small but to see the irrigation system with your own eyes is pretty amazing. It is an educational tour for me. That information about the irrigation system is very interesting. That was quite impressive for the time, right? Thanks for sharing! Karez Well is reputed as one of the three major construction projects in ancient China, together with the Great Wall and the Grand Canal. I totally agree this is very impressive project back in 2000 years ago. Wow, very intresting. It kept me reading until the end. Learned something new. I am glad the Turpan 2000 years old irrigation system did not bored you and you manage to finish till the end of this post. Thank you so much for your kind words. Wow, such a detailed post that would be so helpful to plan a great trip to China. Loving the pictures so much. I am glad that you wanted to start blogging as well. My blogging lifestyle has helped me to document many of the interesting events of places that I have been to. It also helped me to grow and learn to be more observant when I visit a new place, look at the details and ask why. See from other perspective and be bold and try new thing. This looks cool! Ancient stuff is always so breathtaking! Thanks for your comment. Ancient people are brilliant in many ways! The thing they built many thousand years ago without any fancy tools are just jaw dropping when you look at this. And Karez Irrigation system is just one of them, also known as the underground Great Wall! Wow, great photos and a great write up. I want to visit China (but the visa is a lot of money,even though I am like 2 hours away). I am always fascinated with the minorities and their cultures in China (and around the world). I want to check out this part of China! I totally agree with you that the China visa is a bit of the pain, the cost is quite expensive. Luckily for Singaporean we can travel to China without visa. It did help us save a lot of money. My mom who is holding an Australian passport paid over USD100 for the China visa, that was such a pain! Wow what a beautiful and intriguing place to visit! I would love to visit someplace like this with such history…. i’ve been watching a cooking show recently that shows how Chinese cooking has influenced other world cuisines through the trade along the silk road and I’m not surprised that these ancient people were such ingenious inventors. These day the cooking show and master chef show is really popular. Chinese cooking did have strong influence from the ancient silk road trade route. Many of the western element get introduced at the crossroad of Silk Road China! This is so interesting! My husband and I are planning a trip to Asia this spring and have been looking into this and so many other archaeologically important sites. Hope you have a wonderful visit in Asia! It is really bizarre to see this underground water system was done 2000 years ago. This is very neat how without modern technology the people back then created this incredible water system. It is always amazing to read of such talent. This is interesting, ancient stuffs always fascinates me. Is it cool that until today some of it are well preserved and open for the public for them to learn things that happened in the past. Thanks for your comment. 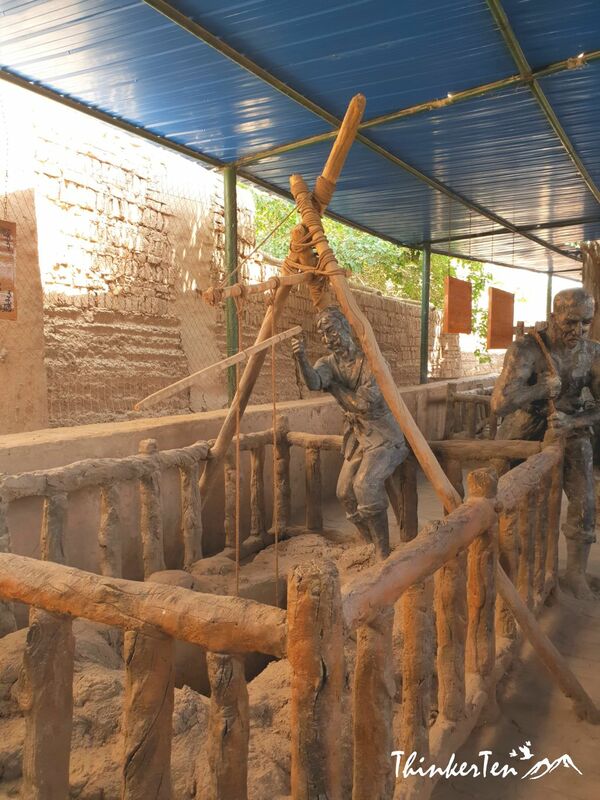 The Karez well was invented and built by ancient farmers from the various ethnic minorities of Turpan. It was an educational tour for me to learn about the water system back in 2000 years ago. Oh wow it looks like there is so much history and culture to explore here. It was so interesting to learn about the 2000 year old water system too! Wow! Never heard of this place. Will be researching more about this place. Jiaohe Ruins is located in the crossroad of Silk Road China. Not far from Turpan city in Xinjiang China. Anyone who is visiting Xinjiang should not miss this place! Wow this is incredible! I’ve never heard of this place, but it sounds wonderful. It always astounds me how resourceful all the ancient people were. The buildings here were all contructed by earth. Ancient People dug houses and rooms downward from the earth and built with dried bricks. Agree with you that ancient people are so smart! This looks like it would be such a beautiful place to visit. Definitely on my bucket list! It would be a dream to go here! What was your favorite part? My favorite part is learning about the history of the irrigation system. It was just jaw dropping to learn they dig out the Karez water system with their own hand and not sophisticated tools. Ok now I am jealous, what a remarkable experience !! thank you for sharing.